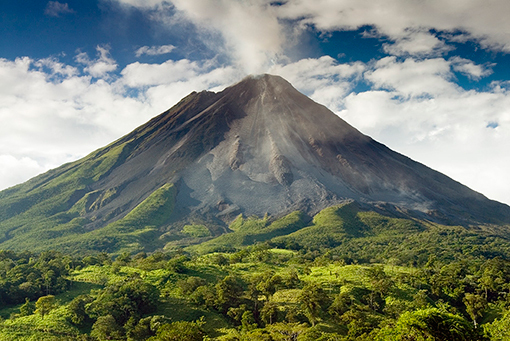 The Arenal Volcano has been one of the main attractions in Costa Rica for years. The lava flows, smoking craters and dramatic explosions made this one of the “must see” locations in Costa Rica. 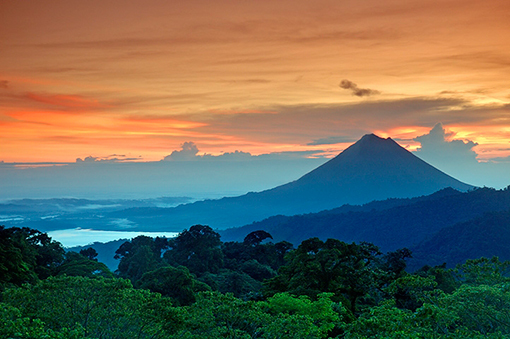 Then, in October of 2010, the Arenal Volcano went quiet. To keep up accurate information on the situation with Arenal, we spoke to the volcanologist that we rely on for this kind of information, his name is Gerardo Soto. Gerardo is a geologist whose specialty is Volcanology. He has his degree in Geology from the University of Costa Rica and his specialization is from the Japan International Cooperation Agency. He lived in Japan for 4.5 years and was a professor at the University of Kagoshima. Gerardo works in subterranean exploration and is an international consultant on subjects having to do with Seismology, Volcanology and Geology for Peru, Dominican Republic, Salvador, Bolivia and Panama. The Arenal volcano has not had any major episodes recently, but the volcano continues to be active. Pyroclastic flows have now stopped entirely, and the crater has closed in on itself. Below the collapsed crater however, fumerolic activity does still continue. Not having any flows means that we can access areas on the volcano’s flanks and in the park that were until now dangerous. We are thrilled to have this opportunity. However there is still a danger of what is called a phreatic explosion, at the crater; where gas pressure builds up to the point of causing an explosion. This can be deadly for anyone who is too close to the crater at the time of the explosion. Because of this, do not listen to anyone who says you can go right up to the crater! We have heard that people are hiking to the top, and this is very dangerous. You may remember a video of a recent phreatic explosion in Japan in September 2014 - that was a crater assumed safe and frequently hiked to, and reports say up to 30 hikers died. We are now offering hikes along trails that offer views of the volcano and natural history opportunities in the National Park. These are trails we have not offered in years. There are also new activity options that offer a geologic history tour of the region, where you can learn about Arenal’s explosive past. However, we are strongly discouraging anyone from hiking too high up the mountain side, and definitely from trying to go for the top. If anyone offers you this activity they will tell you it is safe, but because of the danger for a phreatic explosion, this remains untrue. Please consider the list below. It covers a few areas we still consider unsafe, although in most cases the danger has moved from lava flows to landslides possible in times of high rain and thus loose earth. Tabacon Spa is located on the NW side of the volcano. In June 1975, before the spa was built, an avalanche of rock and burning gases passed over this very spot. Now we are no longer worried about pyroclastic waves, however, as the hotel spa is in a depressed valley, it remains vulnerable to lahars, also known as cold avalanches. It’s a good idea to avoid the Spa during heavy rain spells. Please call us to arrange for alternative hot springs visits. The hotel itself is on high ground and out of the way of any danger. The old lava trail at Arenal Observatory Lodge, like the Tabacon Spa, it is no longer at risk of pyroclastic flow, but it’s route down through a valley means it remains risky for mudflow especially during heavy rains. If you are in doubt, call us and we’ll make alternative arrangements. If you plan to book a horseback riding trip on your own. Keep in mind that some horseback riding trips operate in areas that are too high on the volcano. It’s a good idea to ask where they are taking you before the ride. Feel free to call us if you’re unsure. Important Note: Costa Rica Expeditions guides and drivers will NOT visit high-risk areas and are instructed to keep guests away from them. If a guest insists, he or she is free to arrange transportation on his/her own.